Feather steaks are so called for their marbled appearance and if thinly cut, cook within minutes, making them ideal for summer barbecuing. Place the oil, red wine, rosemary and garlic in a shallow dish and whisk together. Add the steaks and turn to coat. Cover and marinate for 2-3 hours in the fridge. Meanwhile, mash the butter with the parsley and chopped olives using a fork. Season lightly then place on a piece of parchment paper to form a cylindrical shape. Roll up, twist the ends to seal and chill. Preheat a barbecue or griddle pan to hot. When ready, place the steaks on the barbecue or griddle and cook for 3-4 minutes on each side for a medium steak, or 5-6 minutes for well done. Cut the butter into 8 thin slices and place 2 slices on top of each steak. Remove the steaks from the heat when the butter starts to melt. 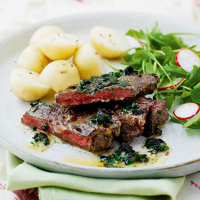 Serve with new potatoes and a rocket and sliced radish salad. The butter can be made in advance. Keep in the fridge until ready to use. You could add a crushed clove of garlic or other fresh herbs to the butter. A Southern French Shiraz made with great care, with plenty of structure, will complement the tenderness of this steak.